Follow The Sun I Sweet Caroline. Photography I Dean Isidro. Featuring I Caroline Vreeland. Location I Hamptons, New York. Little Loveshack I London Scout. Photographer I Lydia Hudgens. Model I London Scout wearing LSFxRomy&theBunnies. Location I New York, NY. A typical day starts for me at 6 am. I wake up 3 hours before Scout so I can tackle emails and create content for the blog. Once she wakes, we usually have a full schedule of photoshoots or playdates depending on the day. We always make time to scout new neighborhoods around the city so she can learn about them. We love to dance in the mirror! We both pick a song and dance around the living room before bed. We usually end up in the bathroom washing our faces together while she chats about her day. Trust me, she can chat for hours. Exploring the city, traveling, laughing and meeting new friends. Yes, we travel often and I have it down to a science. My daughter carries her own suitcase which makes packing easier. I always roll and tuck each item of clothing so it fits perfectly. We both sport harem pants and comfortable sneakers for airport chic style. I always bring a seat back organizer filled with snacks, crayons, and other activities that she can reach from her seat on the plane so I don't have to rummage through my bag every five minutes. Grab a pair of boyfriend jeans, v-neck tee, and Birkenstocks for a relaxed look. Pull your hair in a bun and accessorize with sunglasses and delicate layered necklaces for a chic, on-the-go look. I much prefer to color coordinate with my daughter rather than matching from head-to-toe. Oddly enough I stumbled upon a career that incorporates both. Although content-creating is usually a 24-hour job I do have to set my camera aside and genuinely spend time with my daughter, which we do on the weekends. We usually cook together, go to the museum, or just stay at home and play pretend makeup. I try and spend as much quality time as possible since they grow so quickly. A pair of rainbow sandals by Stella McCartney. The cupcake print circle skirt! Of course she had to eat a real cupcake while wearing the skirt. Loveshackfancy I Joni Top and Ruffle Mini Skirt I Ruffle Racer Mini Dress. Loveshackfancy x Romy & The Bunnies I Cotton Peasant Top and Cotton Harem Pant I Cupcake Peasant Top and Cupcake Circle Skirt. Video I Julia Restoin Roitfeld : Romy & The Bunnies. Location I Mecox Farm, Hamptons. Event I LoveShackFancy x Romy and the Bunnies. Event Photographer I BFA. Lookbook Photographer I Kim Myers Robertson. Styling I Clafoutis. Food I The Dairy. 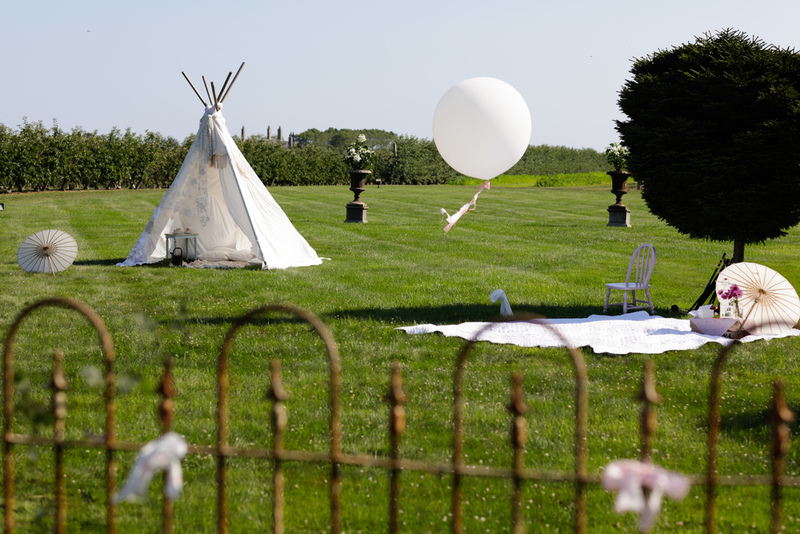 Location I Mecox Farm, Bridgehampton. Julia and I met last summer in the Hamptons through our little girls, and we immediately all became close friends. We live quite near each other in NYC as well, so we spent many afternoons playing in the west village and having lunch just us and the girls. We have a very similar sensibility and aesthetic, and I've always admired Julia's website Romy & The Bunnies. It felt like a very natural step for us to collaborate to create this adorable 32 piece capsule collection for little girls ages 6 months to 5 years old. 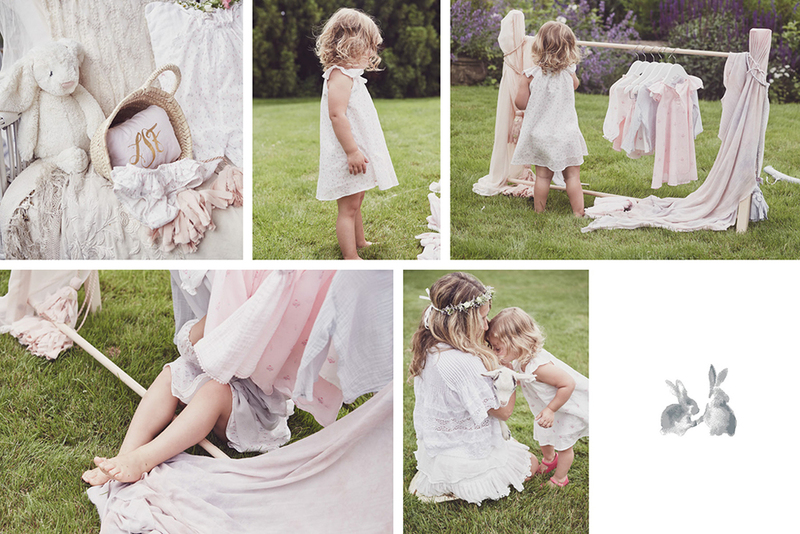 We both live for little girls' clothing, and wanted to create a line that would be pretty enough to be part of a fairy tale, but playful and comfortable enough for the girls to run around and play in. 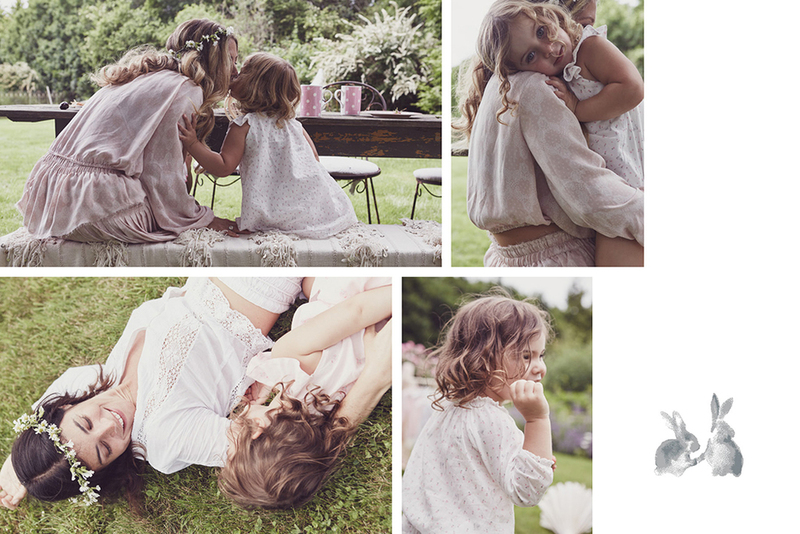 The pieces are meant to be as whimsical and playful as our little girls who inspired the collection, so we added sweet little pom pom trims, soft cotton gauzes, beautiful bunny liberty prints and cupcake prints to the collection. We chose 8 styles that would best reflect the girls' favorite pieces, from mini skirt to flutter sleeve dress, peasant tops to rompers, harem pants and hoodies. My special favorites are the little bloomers and bandanas. 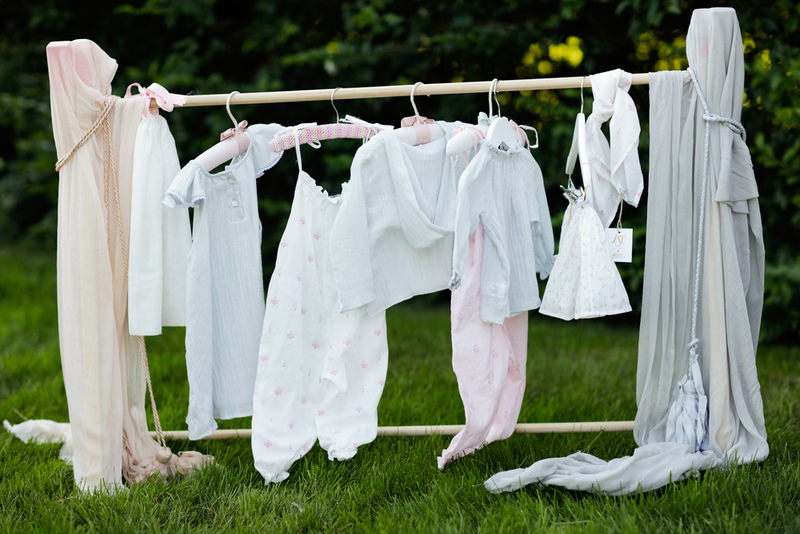 The clothing has an organic French feeling because the French tend to make the best children's clothes! We wanted the pieces to also work with our Loveshackfancy collection, so that mothers and daughters could easily wear the pieces together. Julia and I are both entrepreneurs with a strong interest and background in fashion, with little girls who are quite interested in fashion themselves! It was a wonderful experience collaborating with Julia. We have so many great ideas and truly loved working on the creative process together. We put together a beautiful photo shoot and enlisted our friend and photographer Kim Myers Roberson to shoot the girls. We invited some friends out to my mother's house where the shoot, and our later launch event would take place, as we wanted the whole setting to work perfectly together. In a joint creative effort we made vintage lace tipis, little tea parties, and invited real bunnies and baby goats to frolic with the children in the bucolic setting. Unfortunately, the day of the shoot was quite gloomy and rainy, but the photos were still incredible. In order to celebrate the launch of our collaboration, we decided to create an elegant French picnic at my mother's property in Bridgehampton, NY. It felt like the perfect magical setting to host these little fairies and celebrate this very special collaboration that was so close to our hearts. Having spent summers at this house since I was young I have all of my most cherished memories here. Remembering all of these beautiful moments. 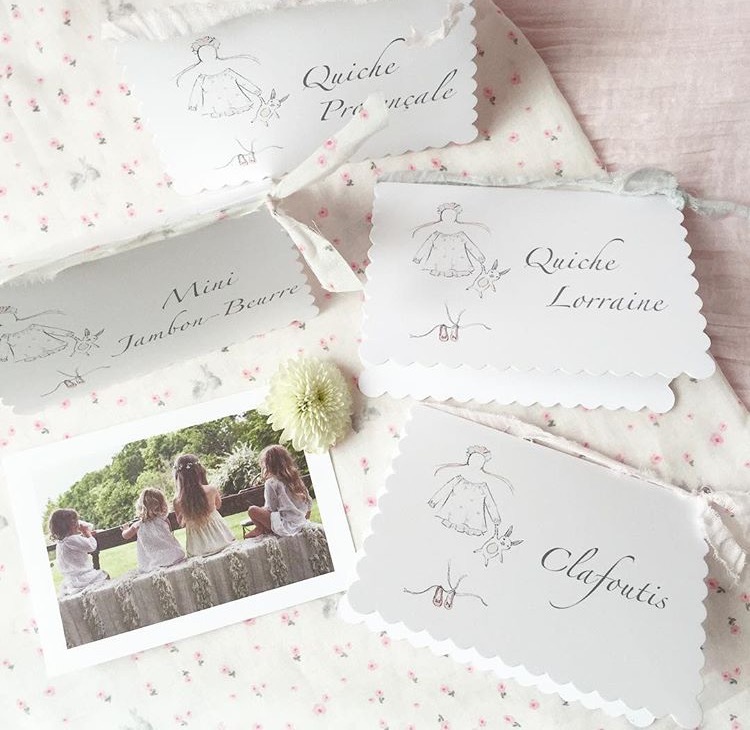 from my daughter's first birthday to my wedding to multiple summer full moon parties, it was the natural place to host the party for our little girls collection. Our ideas would come to life in this incredible setting: an old Bridgehampton farmhouse surrounded by the apple orchards. 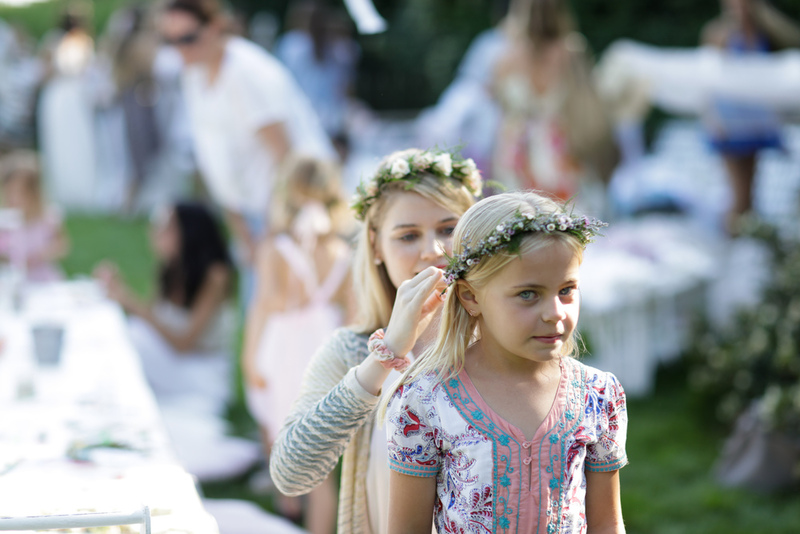 We enlisted little girls party stylist Anne Ligeard Murat, of her fabulous company Clafoutis Creations. "When Rebecca told me about her upcoming collaboration with Julia on a capsule collection for little girls I knew something magical was in the making!" says Anne. "Discovering the line sheet was very inspiring for me. 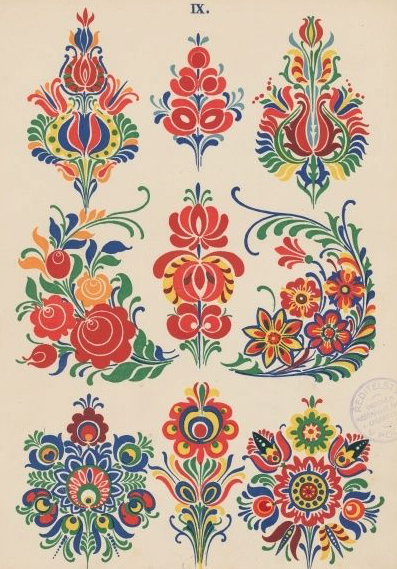 I noted adorable and charming hand-drawn sketches of the clothing with little accessories such as plush bunnies and wildflower crowns. 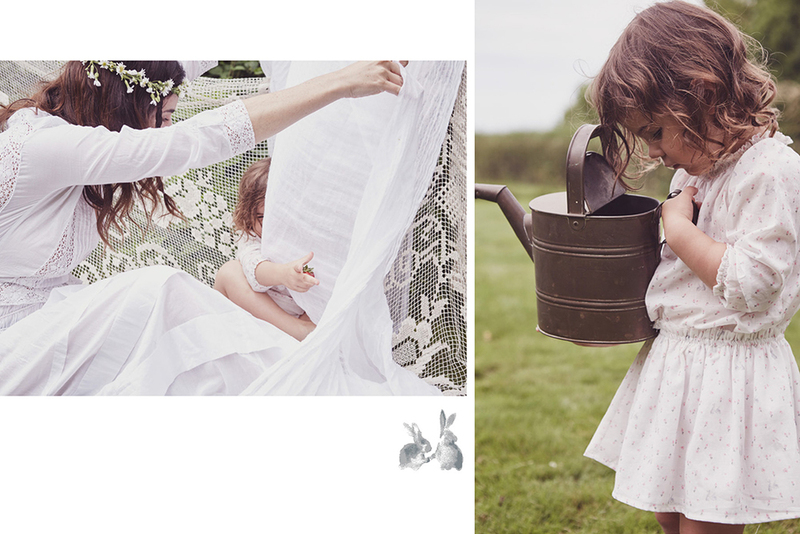 The prints are soft and delicate featuring tiny garden roses, bunnies, and geometric cupcakes. 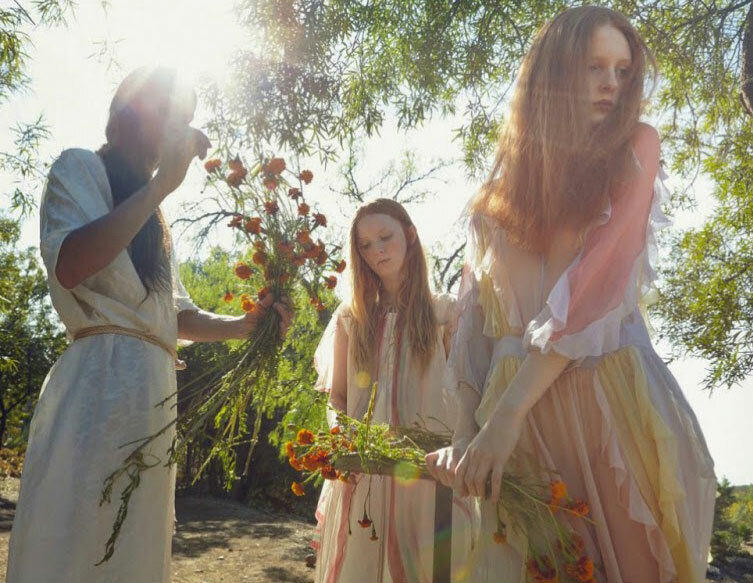 It transported me right away to the event, envisioning free spirited little girls wandering in a magical garden wearing the enchanting Loveshackfancy x Romy & The Bunnies clothing. 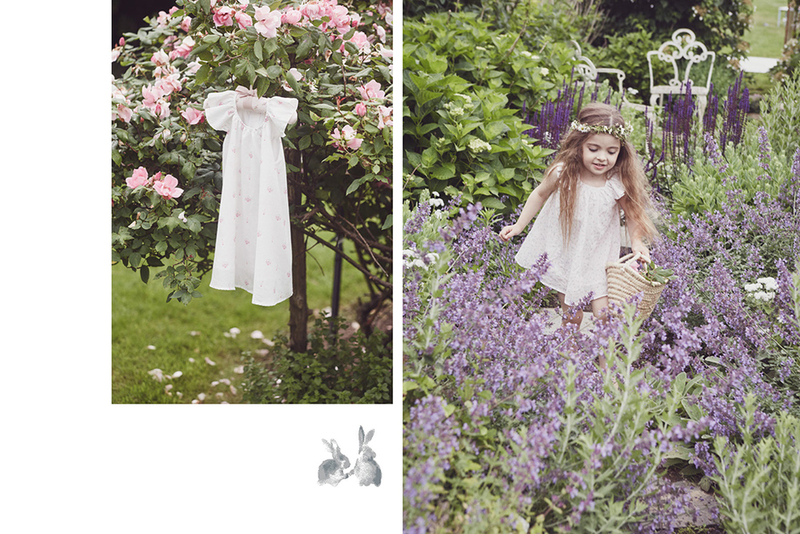 Our goal was to convey the impression that the girls had been playing in this lovely garden by themselves. 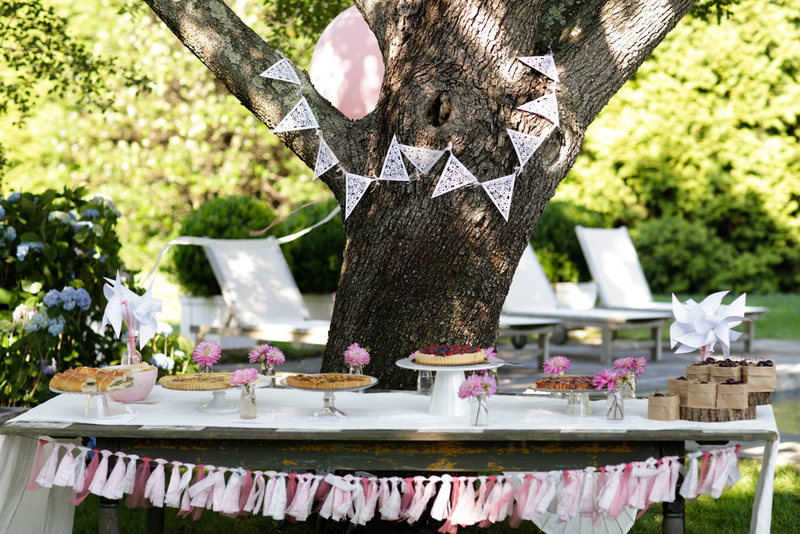 They set a tea party for their dolls and bunnies, displaying their favorite treats like candies and meringues. 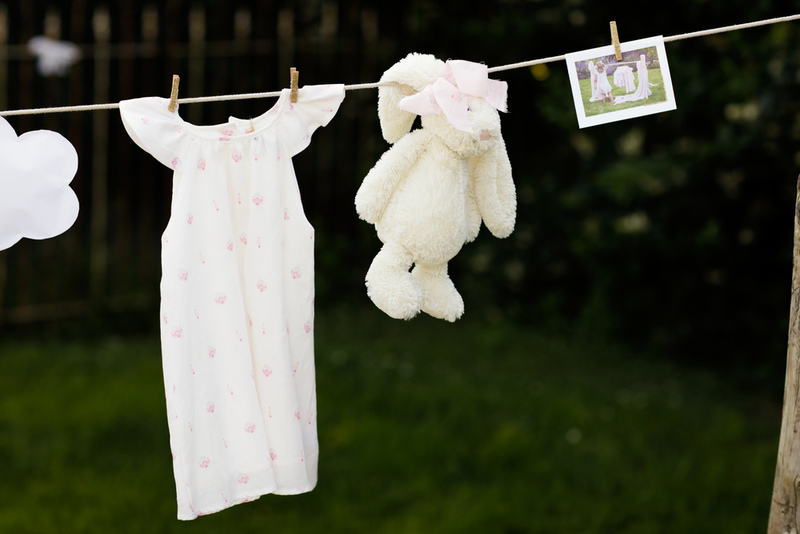 They played with water and let their beautiful clothes hang to dry on a home-spun clothes line. Everything would have to look pretty and simple to express the innocence of the little girls. Watching the children do exactly what we imagined they would was delightful: there they were hiding under the buffet table eating all the candies they wanted, getting carried away artistically by painting outside the lines and adding all tones of glitter glue to their work; they were running through the grass and picking flowers. What a dream-come-true for us adults! 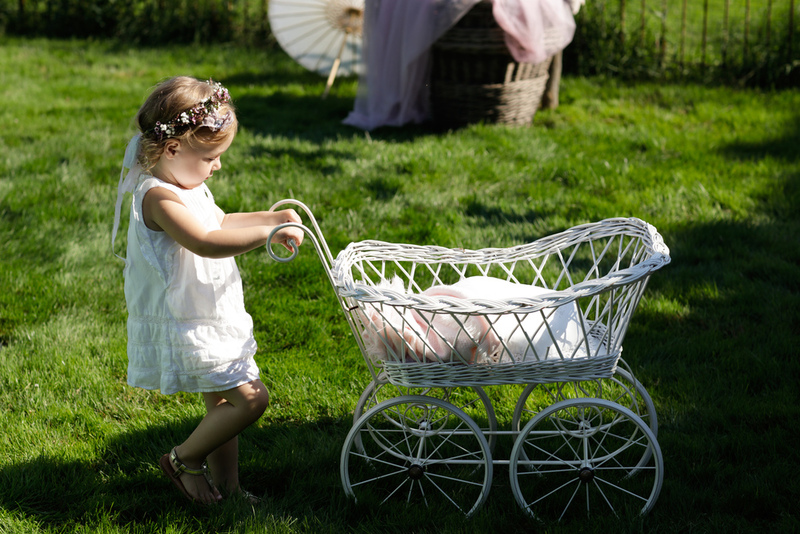 At the end of the party came the most enchanting moment, true magic from the fairies themselves - a tiny baby bunny bounded from the orchard toward the children!" Anne helped us create the perfect thank you's for all the children who attended : a lovely picnic basket filled with Loveshackfancy x Romy & The Bunnies goodies, plus sidewalk chalk, tattoos, and bubblers. Both Anne and Julia are French, so creating the French picnic theme seemed like a natural idea. As Anne describes, "We though of French picnic classics for the food like delicious jambon-beurre sandwiches on mini baguettes, lovely cheese quiches, bags of cherries and of course, no French picnic would be without a clafoutis!" Our close friend Jordan Blitz recently started an amazing catering company based in Red Hook, Brooklyn called The Dairy so we asked her to help with the food - and it was everything we could have dreamed of. The party was a perfectly magical day, and everything we wanted. All of the little girls (and boys) and their parents who attended truly took in this beautiful setting and this enchanting world we created. We invited many of our close friends and supporters of Loveshackfancy and Romy & The Bunnies. It was a sight to see! We hope to pass along this beautiful collection to everyone who can appreciate the magic that lies within these special little pieces.